Well, this is the final installment of the Wedding Appetizers. When I was preparing all this food, it didn't seem like a lot, but in retrospect WHEW! 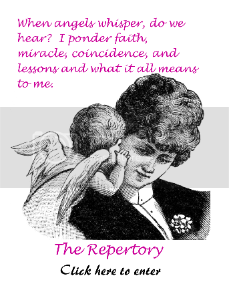 No wonder it has taken me a week to recover (smiles) but it was all worth it. One thing I learned while researching appetizers is that if you have one of those mini tart pans, wontons and/or a reliable biscuit recipe and a wooden tart tamper, there are innumerable appetizers that you can make. I saw a hundred good ideas from mini tacos, lasagnas, pizza, salads, mousse, pates, you name it or if you can dream it, you can have an appetizer tray that will leave people talking and eating and wanting more. I chose these for a couple of reasons. I wanted to have diversity in the color, shape, and ingredients in my appetizers. Also I thought they would work well served at room temperature (they were good but warm would have been better, I think) and because I wanted to avoid the sog factor (remember I had to travel three hours from my house to the wedding destination). Preheat oven to 375 degrees Fahrenheit. Lightly grease a mini muffin or mini tart pan. (I used baking spray). In a skillet over medium heat, cook the bacon until evenly brown. Drain on paper towels. Crumble the bacon into a medium bowl and mix with remaining ingredients. Separate the biscuits into halves horizontally and place each half into the cups of the prepared tins. Fill each half with the bacon mixture. Baked for 10 to 12 minutes or until golden brown. Made 24 mini tarts. **As luck would have it, I did not have an ounce of mayonnaise in the house so I used an equal amount of ricotta cheese. **I'm not a big fan of refrigerated biscuit dough so I used a single recipe of my favorite homemade biscuits and used a walnut sized piece of dough in each mini tart opening. The wooden tart tamper is a wonder for this! If I remember correctly, the time was a little short, and I ended up cooking these an extra 3 or 4 minutes to get a desired level of golden brown on the biscuit. No real recipe here, more of a how-to. Have ready your favorite meatballs, rolled into mini size, all cooked and waiting. 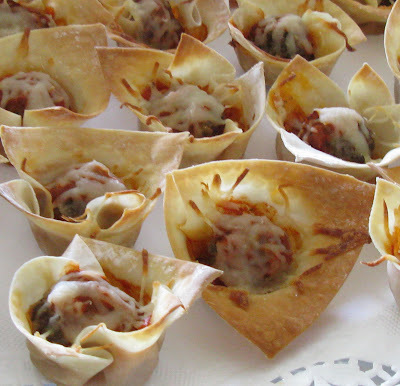 Place wonton skins in each cup of a mini tart pan. (Or you could use biscuits again, yum!) You'll probably have to ruffle them in to make them fit into the cups, but that only adds to their appeal. Place a meatball into each cup. Add a couple of teaspoons of your tomato sauce, a sprinkling of cheese, bake at 350 degrees Fahrenheit for 10-15 minutes or until the wontons are nicely browned. I confess, these did not travel well; the bottom of the wontons were a little soggy by the time I served them, but guests were delighted to see something they recognized and there weren't any left. I confess, I loved this! As a matter of fact, I love it so much that I made it again after I came home so I could have a bowl of it all to myself; Ole Sweetie-Pi doesn't like cranberries so I this is all for me, smiles. If ever you want something special to serve on bagels, this is it. I can't stay away from it. However, regrettably this did not go over well at the reception. Perhaps it's because it's a spread and people didn't want to have to stop and fuss with it, perhaps it's just not good with crackers, perhaps because it's a little on the sweet side and doesn't go with alcohol, perhaps because it something that folks didn't recognized (like onion dip) and they were reluctant to try it. Whatever, the reason, I had almost half of it left over. Oh, well, live and learn. Mix cream cheese, juice concentrate, cinnamon, and sugar with an electric mixer on medium speed until smooth. Fold in the orange zest, pecans and cranberries. Cover and refrigerate. **I didn't have fresh orange zest, but what I do keep on hand is the dehydrated orange peel you can find in the spice section of your grocer's shelves. I added 1/2 teaspoon and it was delicious. Katie, I know how much it this was to put together. These appetizers are beautiful. I can see your love all wrapped into this beautiful wedding food that your prepared. I/m working backwards but am in awe of what you did. And as for those tomato cups... they'll be at my table. Katy, you would have had to FIGHT me for that spread! I love cranberries also. in fact I think I need to make bagels just so I have an excuse to make that spread! 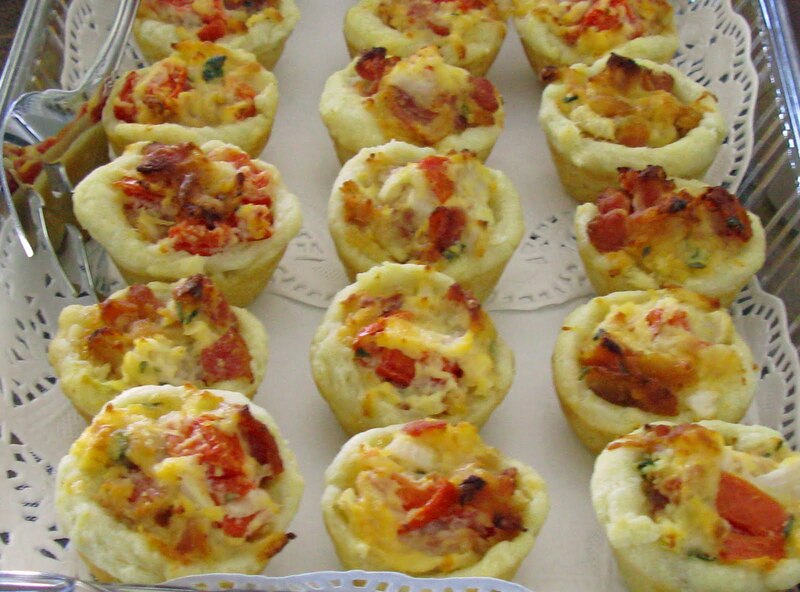 The bacon and tomato cups are surely a must try and the cranberry spread is irresistible! You made all of these?! Wow, everything looks amazing! I just scrolled down to catch all of the goodies. I love the cheddar cheese crackers and the wonderful bacon and tomato cups. Heck, it's all delicious! I agree with the commenter who said she could see your love all wrapped up in the appetizers. Well done! I've loved reading about your appetizers. They look so beautiful and tasty. Thanks. All of your appetizers looked positively amazing! The amount of thought and care you put into your food is so clearly evident! Oh wow!!! Just went through all the appetizers - just amazing! Hope you'll link some of these up to my new Tailgating Time meme, they would all be great for the Sunday gameday buffets! You out did yourself. What an incredible array of flavors and textures. That looks wonderful my dear..I love these appetizers! Katy it all looks so delicious. 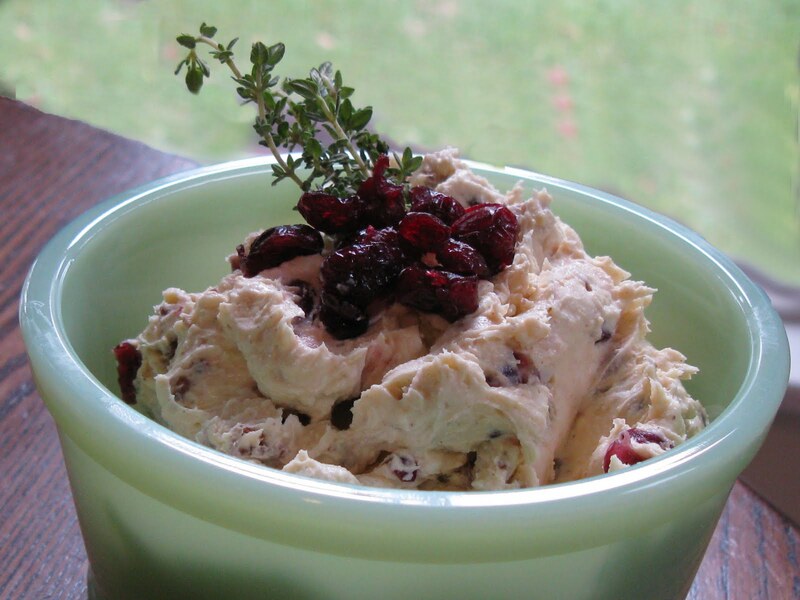 That cranberry spread is bookmarked for the holidays. It sounds fabulous. And the tomato bacon cups, yum! Hey katy,how are you ? Wow thatz a handful of decadent appetizers to hog on for.I will definitely forget about the occasion n keep eating them :) Lovely display too . Oh, my gosh, Katie, you have my mouth watering! You definitely outdid yourself! You missed your calling -- you should go into catering -- I would hire you in a heartbeat! I would have loved to sample all your appetizers. They look absolutely amazing! Great job!! What an amazing job you did with all these appetizers! This spread sounds divine. I love cranberry anything. I definitely will be making this for the holiday season. Oh, I'm diggin those meatballs! And I just bought some frozen ones (I know bad Mama not making my own!) for just such an occasion. These would make an excellent weekend lunch for the kids. I am an old-fashioned girl at heart, loving old recipes, while still embracing the new. 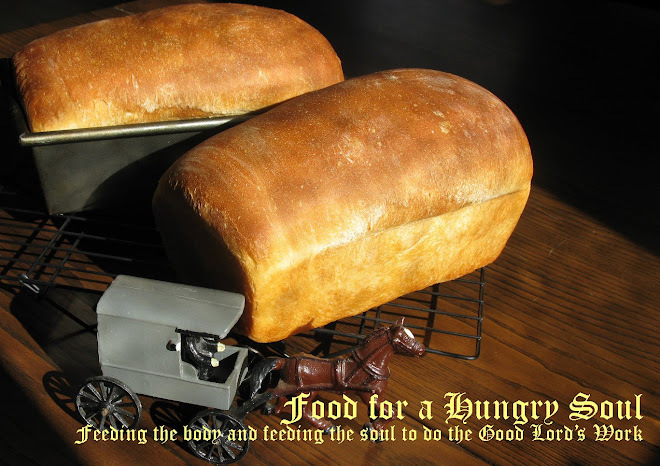 I look for simplicity, deliciousness, and frugality, with an occasional splurge. Many memories are made around food. Let's make good memories together! Come in and sit a while.